The next trip is just around the corner, so why not brainstorm a few of the places you’d like to go. There are many ways in which you could do this: something visual (like mine), a list, a mind map.... The possibilities are endless, so decide what works best for you. Once you’re ready to book your trip, you will want to start planning. 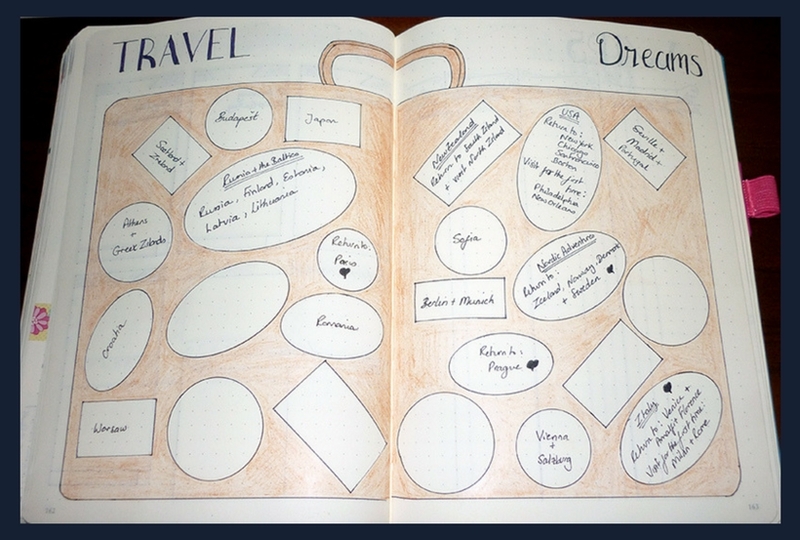 Use your BuJo to note travel arrangements, accommodation, and other vital info. You may also want to brainstorm attractions to to visit and places you wish to see, noting any opening/closing times, costs etc. In many countries there is a particular day each week when museums etc. are closed. That’s the sort of thing you’ll want to know in advance, so you don’t arrive to find the doors barred. The last thing you want on your dream vacation is to arrive and find you forgot your camera, so use your BuJo to create a packing list, ticking off the items as you place them in your luggage.